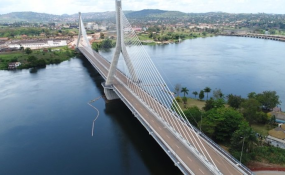 Uganda Opens Africa's 5th Largest Bridge - "Source of the Nile Bridge"
Uganda’s new bridge, aptly called 'Source of the Nile' as it runs across the Victoria Nile. Africa's fifth-largest bridge has been opened in Jinja, the eastern region of Uganda, dubbed "Source of the Nile Bridge". The cable-supported bridge is 525 metres long and is expected to "last for 120 years", according to President Yoweri Museveni. Uganda's new bridge, aptly called "Source of the Nile" as it runs across the Victoria Nile, cost an impressive US$112 million to construct. Of this cost, 80 percent was financed by the Japanese International Cooperation Agency (JICA) at an annual interest rate of 0.01%, payable in 10 years with the option to extend. The bridge was built by a Japanese contractor, Zenitaka Corporation, in partnership with the South Korean Hyundai Engineering and Construction Company. Furthermore, the bridge, which was completed in four years by a 67% Ugandan technical staff, is expected to ease the heavy traffic on the 64-year-old Nalubaale Bridge and connect Kampala with Kenya's Mombasa port. This essentially makes the bridge an economic lifeline for the landlocked country. Shinichi Kitaoka, the Japanese International Cooperation Agency (JICA) president in Uganda, told local media that the facility was erected using Japan's latest technology in bridge engineering and its distinctive features will benefit the entire region. "The technology used here will inform future projects in Uganda and Africa," he said. Despite the heavy reliance on boda bodas (motorcycles) for transportation, President Museveni says the bridge is "only for vehicles and pedestrians". The bridge is expected to also boost tourism, according to Samuel Muhoozi, the Director of Roads and Bridges at Uganda National Roads Authority (UNRA). He told local media, "One of the aims of constructing this bridge was enhancing tourism with the addition of this iconic signature bridge in this picturesque location."